Do you work for After Effects? Learning about Adobe After Effects? We can help. "Currently use it to create lyric videos for up-and-coming artists"
"Great animation tools for those who know how to use." The consistent layout between all of Adobe's products is carried out through After Effects, making it easy to know where to look for certain items. Great tool for animation, motion graphics, and adding action to simple, short videos. Easy to use templates and support makes this program a great asset to any company. After Effects takes a while to get used to and does have many intricacies to master the program. Though it relates to other Adobe programs, it is a bit cumbersome to manage and work with at first. Without templates, I would struggle mightily to understand how to us After Effects. Look for templates and other supports to help master After Effects. It is a strong tool, just takes a while for someone to Master. We have used After Effects for logo animations. We use templates from Motion Array to import into After Effects and animate logos and text. These logo animations when paired with videos created in Adobe Premiere Pro have added great, local content to spice up what could be a simple, amateur video. The time spent on After Effects has given spice to the videos we create and share. These videos then are noticed at many of the conferences and presentation opportunities the church has. "Adobe After Effects - Motion Graphics with Premiere Pro Integration"
Adobe After Effects is an incredibly powerful tool. My favorite feature is the motion tracking that can apply effects to moving items within a video and allows for very realistic compositing. The motion tracking technology is also used for stabilizing shaky video and anchoring text to moving objects. In addition to advanced compositing and animation, After Effects is a great platform for 2D or 3D animated titles and text. The interface can lag significantly when scrubbing a timeline, even on low-quality preview settings running on a top-end workstation machine. The UI can also get very cluttered with layers and filters stacked on the timeline. I would suggest that anyone looking for a motion graphics package look at After Effects, especially existing users of Creative Cloud. There are many competing programs, some of which may be better for certain workflows or projects, but for many users, After Effects will fill all of their needs. After Effects solves the workflow problems with animated titles and compositing, making it easy to link files with Premiere using Adobe's Dynamic Linking. This saves time and avoids the need for intermediate exports and complex file management. Compositions from After Effects be integrated into a timeline in Premiere. "Easy to Learn and fun to use!" After Effects is a great integration tool in Adobe Creative Suite. It is easy to animate graphics created in Illustrator, and then use the created animation in Premiere Pro. If you want to learn something knew, Adobe has many video tutorials that make learning easy. For first time users, After Effects can run slowly if you do not manage your content appropriately. This can cause playback errors. For a first time project maker, it would be great if there were step by step tips for you to follow. If you do not have prior experience with Adobe Products, it can take time to learn how to use this program. I have been able to create more engaging video and animation content for use on internal channels, and external platforms like social media. I have been able to communicate complicated messages with simplified and exciting graphics, that I would not otherwise have been able to create. "Great possibilities - slow rendering"
It's a slow running app - everyone I've spoken with feels the same, so it's not my computer unfortunately. I would love to see AfterEffects successfully playback audio when previewing my work - especially when I'm animating to music, it makes that very difficult. I have to open another window with the audio file to listen to it and hope it lines up. Not great. I have also always have a hard time using Illustrator and AfterEffects hand-in-hand. Motion graphics and video comping. Great for social content, animated GIFs for web and email, pretty much anything under the sun. I play with illustrated animations as well - takes longer but that's what it's for! "After Effects - Very Powerful, But Not Intuitive"
I love that After Effects doesn't really hide anything from its users, and that it can do almost anything you can imagine. I love the endless layering and the automatic motion blur possibilities. I also really like the ability to include all kinds of different graphics, files, etc. in one composition. I don't like the jargony or symbol-driven options that require you to constantly Google how to use the software. The 3D interface and motion tracking could also be simpler. The pricing system is somewhat unfair, and I would hope that they would allow for a flat-out purchase, rather than endless monthly payments. It used to be this way. The incorporation of sound, and anything time-oriented could be a lot better. If it had a more "Premiere-like" setting option, it would be much appreciated. Obviously it's not editing software, but it would be nice if it had SOME of the functionality at least. Take a short online course on Lynda.com first. Make sure to keep your OS updated because AE will constantly not work when OSes aren't updated at the same time as software. Compositing, motion graphics, and animation. This software is powerful and quick once you know how to do whatever it is you're doing. I know that whatever I need to do, I can do in AE. It is a great fallback, and a skill that is invaluable in the marketplace. After Effects is also effective as a stills editor. "Able to blur faces in CCTV footage"
I like that I am able to take CCTV footage from our CCTV system, edit out a specific part, and blur the faces of those involved if it is required for compliance purposes. It is slow software that takes a long time to render a file, when you have lots of effects like blurring out faces or you are outputting to a format like MJPEG. You will probably need a training course to be able to use Adobe After Effects. I am able to use Adobe After Effects to edit videos for the agency, including when we have incidents that we need to send a video out from our comprehensive CCTV system. I am able to blur faces when required for compliance. It is quite slow to use but it is an essential function and needs to be done, and without it we would not be compliant. "Adobe After Effects For Best Visual Effects "
The best aspects about After Effects is the ability create anything you can imagine the more you use the program. I started out using the program 19 years ago and I really feel that the program has endless possibilities. Once you figure out how to create one step, you can apply it to multiple areas depending on your vision and scope. The program is so complex that at times the interface can be tricky depending on how many layers you have so project management and proper labeling is essential to advancement. Now that you can playback audio with any clip in the later versions of AE was great. So they are heading in the correct direction with all the updated versions year by year. Anyone considering Adobe After Effects should get it if they are skilled effect creators because you have the power to create anything you can imagine the more you experience using the program. We are able to create animated video templates that can be added into our marketing videos as well as lower thirds for title sequences. We also animate with plugins such as Trapcode Particular for a number of videos for social. After Effects is smart, cohesive, easy to navigate, and has a highly customizable workspace. There are also loads of plugins and extensions available for just about any function you could possibly need. The keyboard shortcuts also easy to learn (or change) and that makes the editing/graphics workflow much faster. Occasionally After Effects has trouble giving reasons for render failures and it's up to the user to determine what to change in order to get it to work. For example, a job in my render queue displayed "Failed" status but had no output log to go with it, and I had to run several tests to determine that the job was maxing out my GPU. Some more details or reasons to go with render issues would be a huge help for my personal workflow. The company I work for uses After Effects for 2D motion graphics, titles, logo animations, and rigging/animating Illustrator files, as well as compositing 3D effects into footage. It has been hugely beneficial to have a program that can do both 2D animations and 3D effects/compositing - it saves money for our company, reduces the amount of software we need to purchase licenses for, and reduces time spent switching between applications. After Effects is easy enough for day-to-day motion graphics and titles, yet powerful enough for the most complex projects. There seems to be no end to what is possible to create - and having that tool set challenges me to grow as an artist. It also integrates beautifully with Premiere and Photoshop. In order to animate layered Illustrator files, I have to first go in and prep the file by un-grouping everything - which can be quite a process in some complex stock files. The workflow would be much smoother if Illustrator groups could import as pre-comps with layers inside of them like Photoshop files already do. Buy it and learn how to use it well! I started out as a video editor before the hardware and software became affordable for average users. As prices dropped, a lot of my clients began to edit themselves, which could have put me out of work if it weren't for the power of After Effects and the ability to integrate motion graphics and special effects with even average corporate videos . Now, a lot of clients hire me to supplement their in-house editors at a higher rate than I made editing alone! "A powerful industry standard tool"
After effects is an amazing tool for motion graphics and special effects work (both 2D and 3D). As a person who works in video production, I find after effects extremely powerful and capible of what I need in a software to get a professional result. Adobe always knocks it out of the park with their software and they are always improving on it and trying new things. Definitely worth the investment. After effects can be a bit hard to learn at first. And it takes a good amount of computer power to run well. But I don’t really know if this is a dislike as these things are to be expected in a software where you have so much control and functionality. It’s worth the cost! Highly recommend investing in this product. I work for a nonprofit that is very media centered. After Effects has been extremely helpful in making professional motion graphics and creative videos quickly and easily. Everything about this program is exceptionally crafted and works extremely well. Features are updated often, new features are always being added, and the functionality never ceases to amaze even the best in the business. This is the software of choice for professionals in the film industry for a reason. There are alternatives that perform quite well, but nothing truly compares to the refined brilliance of After Effects, especially when coupled with other Adobe suite products. The learning curve of this program is incredibly high, and will take some time to learn. Tutorials are readily available, but the difficulty of some of the more advanced techniques can take quite a long time to master. The layout can be confusing to newcomers and will also take some time to get used to, but once you're in a work flow you're used to, there isn't a better alternative. Despite this, however, for many it can take years to master this software, with many colleges offering programs solely in the use of this and sometimes other Adobe suite software. If you have the money to invest in the product, that's fantastic, but I'd suggest looking into a complete Creative Cloud suite subscription, as there are so many other products in there that can be helpful that compliment After Effects flawlessly. That said, however, the cost can be quite high, as the service is subscription based. After Effects can be used by more than just the film industry. With smart phones and their cameras getting better, there's no reason why even small business couldn't shoot an ad themselves and edit it together in After Effects. The potential for creating great marketing for any type of business can be realized with this software. Furthermore, though, if you're in the film industry or are just an enthusiast film editor, look no further for that professional looking touch. If you sell advertisements, commercials, shorts, episodic content, or even movies, you can't ask for more than this program offers to get you the refined, professional look you are after. "The best software in the market for creating motion graphics. " 1) Flexibility. Sometimes I think of After Effects as a Photoshop that lets you create animations. I say this because it depends on the user's creativity to really get the most out of the software. You can combine different effects, use free and paid presets, combine footage, etc. 2) Integration with Premiere Pro and Photoshop. As a designer and content creator the integration with Premiere Pro is really important in order to speed things up, especially when needing to change templates or motion graphics quickly. It's also great to have it integrated with Photoshop, so importing layered PSDs is easy as clicking twice. 3) Great community with a huge amount of free and paid plugins, tutorials, presets and templates. You can find them easily in Google or YouTube. 4) When are they going to fix the Caps Lock problem!? If you are planning on using Premiere Pro then After Effects is the way to go without a doubt. If you're on the Mac After Effects is still a strong choice. After Effects helps us create animations for our webinars, videos and webcasts. We have also found it very useful for creating animated GIFs for our email campaigns. After Effects makes it somewhat easy to create great looking titles and animations for your Premiere projects, bring you from average to professional in minutes. There are many online templates that you can use for free to bring your animations to life with little effort. Tutorials online range from quick and easy to long and complex depending on the skill you're looking to cover. After Effects also allows you to create dynamic links between your compositions and your Adobe Premiere projects, making editing your animations a breeze, and reducing the amount of work needed to bridge the animation and video editing gap. After Effects takes a lot of research and fiddling to finally figure out how to efficiently use it. Like most Adobe software, After Effects has nearly limitless possibilities, so figuring out how you'll use it in your roll can be overwhelming. Do your research. Getting into the program is going to prove difficult, you'll need to watch quite a few tutorials and download a few templates to figure out what you're doing. Don't be afraid to experiment with different templates to see how they work, as this is how you learn the fundamentals of the program. We're bringing our videos and advertisements to a new level with animations. Previously our digital menus and digital promotions were all static, however, After Effects has allowed us to bring those things to life for our customers, catching their eye as they walk into our store(s). "Excelent software for video editing / motion graphics"
*I have been using after effects for a couple of years now, and do some motion graphics there, some video editing. *It has a lot of tools to help you create amazing things, it is like working with photoshop in movement. it also has support for third party plugins that are phenomenal. *The learning curve can be a though and long. *If you are using it for video editing (Like me sometimes) it doesn’t have all the tools / shortcuts like adobe premiere. watch some introduction tutorials to get used to the interface, and create awesome things. In combination with other software like photoshop / adobe media encoder you can do whatever you imagine. "Really Nice bit of software!" Easy to use once you get your head around it. You can create so many amazing things with it and has been vital to the continued success of my career. Loads of tutorials online so if you get stuck there is almost always an answer online! Have had a few issues with it crashing but autosave feature usually comes to the rescue! Can be quiet daunting at first but if you stick at you become more and more confident with it every day! If you have experience with other Adobe products you will be able to quickly pick up the interface. There are loads of free tutorials on youtube (some better than others) but usually easy to follow. Literally can create pretty much anything in After Effects! Anything a client may desire! Great for making video content for multiple platforms as size can be adjusted easily! Really upped my social media game! "A Good Program if You're in a Pinch"
I like the simplicity of it, which can be both a pro and con. I use it to make animated graphics for GIFs of my teams logo and the layout of the program makes that simple. I use Premiere Pro for most of my video's, but when I need something quick and simple After Effects is good go-to. Mask Tracking is super useful, and the mask function operate pretty much the same as other Adobe software. I love the Linear Wipe effect and I use it very often for my video's because its an easy way to make something look professional and fun quickly. It lags sometimes, but that's something they've been working on for a while so I know it's an issue they're working on. I think it's a bit pricey, and if I had to choose between it and Premiere Pro, I would pick Premiere Pro because it offers more use to me in my business. Adobe After Effects for me is a quick option for when I want a simple job done. If you're looking to make something small quickly this is the ideal software for it. Its ease of use is one of its greatest assets. Making animated logo's is very easy in After Effects, and I love making GIFs for advertising because it catches people's eye better than just an image. Its nice for making moving banners for websites because of the Linear Wipe effect which is my favorite. Robust, Very well designed software that allows you to create earthing from simple to highly complex animation and visual effects. Simple text animations, chroma keys, complex layering and compositing, 3D space, excellent color capabilities and adjustments. Well supported with 3rd part plug-ins. Plenty of support from other users. Very stable. Excellent integration with other Adobe products. Industry Standard. Is not backwards compatible with earlier versions. No longer available for purchase, only monthly license fee usage. You must be using most current versions off you are working on files from other creators. Learning this software will require a long term commitment. There is a very steep learning curve, but plenty of online tutorials. You must be comfortable with searching for solutions with the internet production community. Creation of visual effects for digital motion. Animation, Special Effects, layering. After Effects allows me to offer clients top level solutions. "Professional outcomes at a low price!" I love the timeline workspace that allows me to put out the exact product that I want to put out. It also works well with premiere, there are some projects that have crossover between those and it's nice to be able to quickly switch work between the platforms. It sometimes seems like some of the commands and controls could be more intuitive. Once you know how to use the controls it gives you full control of your work which is great, but for simpler projects they are more complicated and seem to add time. It will take a lot of hours to use this product to its full potential. Once you get there it is 100% worth it, but it will get frustrating at times. I have mostly used this program for countdowns, intro, and outro videos that deal with manipulating scenery and text.
" Great to create animations in logos!" After effects is a program of the adobe family that allows us to create animation effects in general, and editions in videos like for example to place special effects on green screens. It is an excellent Adobe tool, deal for people who are dedicated to the creation and design of animated graphics, but you also have to know that it can be used and with very good results to perform all kinds of visual effects. Another advantage is that it also has a function which draws attention; 3D Render that what you get is to create intersection levels of a very good quality. Do what you want, what your imagination can create. Bring a tool to program several cameras to take the image or video in different positions as if you were in a studio. The disadvantage is that there are not many users who can buy the original and thus be able to use it on their computer, since it is a program that many people use around the world to create web pages or to dedicate themselves to the world of Multimedia, visual effects and animated graphics can be applied in such a large field, as in the case of digital video, cinema, or broadcast. I recommend it because it is a great tool to work on audio visual projects, where they involve adding special effects in general, besides being very dynamic to animate logos! I have worked doing advertising spots, interviews and making videos to offer the services of the hotel where I work. "Great for designers bridging the video project gap"
I really like that I have a live preview of my work in progress, and that there is a very intuitive interface. I'm not primarily a "video guy", but by creating assets in Adobe Illustrator and importing the vector files into After Effects, I find that it is easy to be that "video guy" even when there is not one available. I am far better at creating the graphics than I am at producing video, but this program allows me to bridge the gap fairly seamlessly. There IS a learning curve associated with this program, and it is far more capable than I am, but it is intuitive enough that a novice can figure things out and make some amazing things. I don't like that there is no way to "preview" projects when looking through project folders unless you export the file. You also must be very familiar with video export options, because there is not much in the way of a knowledge base associated with the program. Adobe does offer wide-ranging help, but if you are not a frequent user, it feels like a lot of the knowledge is "assumed". Tooltips with more descriptive terminology would be a boon for novice users. Highly recommended for designers needing to bridge the video gap and get their feet wet. It's always good to be a "jack of all trades" and AE makes it a little easier to get your foot in that video door. I work with a variety of startup businesses, and they all need short (very short) video blurbs for their website that utilize graphic elements. I like that I can quickly layer video and graphic files to produce video shorts in very little time. Commercials, patching together videos, and utilizing Photoshop product mockups is easy with After Effects. I have been using After Effects for the last 7 years, and I keep learning something new. People often get overwhelmed when starting with After Effects, but that is quickly made up for in its versatility. If you're only working on a small project with light effects, it's well easy to get it done. Likewise, if you have an effects-heavy sequence with 3D modeling/animation, rotoscoping, particle effects, etc, you have an arsenal at your hands. This is only compounded by how easy Adobe makes it to modify After Effects. Lacking a certain effect? Drag and drop a 3rd party plugin. Don't know how to accomplish a specific effect? Load up a preset. Add in built-in Maya and Mocha, and there is nothing this program cannot do. The only down-side of this program is how complicated it seems from afar, but this is usually not an issue for anyone getting started in compositing. Because of After Effects' versatility, light projects have very fast turnover. This is especially important when you are working on a Premiere Pro project that's linked to an After Effects project. Light projects render very quickly, meaning you can get back to cranking out client projects in a breeze. "Adobe After Affects - Industry-grade software at your fingertips"
My favorite part about Adobe After Affects is that it puts the tools in your hand needed to make a feature production. Honestly guys, the possibilities in video production and editing in this program is endless. In my time using the program, I have created results far beyond what I thought I was capable of. One of the hardest parts of getting to know Adobe After Affects is the learning curve. It's not an easy program to use - but with some time & effort, you can get far with it. Get this program if you are considering getting into the video production industry. Being able to create videos that appeal to a large audience online. This program is what puts you on the same level with everyone else in the industry. It can be intimidating at first. "Gran cantidad de ajustes para editar videos"
La cantidad de ajustes y cosas que se pueden realizar con el programa, desde edición sencilla hasta cosas a la altura de efectos de cine. También me gusta mucho la gran cantidad de Plug-ins que hay en Internet, haciendo así que el programa tenga más cosas para editar. Tiene una gran comunidad detrás, por lo que abundan los tutoriales. El problema que veo es que, al principio el programa es un poco difícil de entender su funcionamiento, pero por eso hay una gran cantidad de tutoriales por internet. También se necesita un ordenador con un procesador potente, ya que el programa necesita mucha memoria RAM. "Puppet Engine distortions let me animate characters"
I like how I can use the Puppet Engine to distort characters to make animations, in time to speech, making puppets that tell a story. Adobe After Effects is very difficult and time consuming to learn, and it seems like when I have learned a feature, a few days later I will forget how to use it and have to refer to the help again. I use Adobe After Effects to make motion graphics that I export and save to YouTube. I create infographics, and character animations to tell stories. It is a very complicated software and difficult to learn, but once you have some momentum you can make some of the best motion graphics, and no other package comes close to Adobe After Effects for motion graphics creation. "An Editing Suite for Animators, designers, and compositors for video editing and many more." Adobe After Effects is an industry-standard for animation and an creative compositing app. In my opinion After effects is the best editing suite, it is very complete and versatile ,all its tools are well organized and it is easy to find the one you need and use it. This software provides effects and results with a high level of quality, so using its tools in an appropriate way which allows the user to have the best results. On the other hand this is the software par excellence for Video editing, we can apply effects of all kinds, when it comes to video editing the possibilities are almost endless. A costly software if you just want to learn video editing and want to be a video editor. Complex features that are all over the place and not easy for new users. No simple controls for ease of use and understanding. Adobe after effects will continue to be the industry standard for creating cinematic movie titles, intros, and transitions.– despite the price, knowing it is essential for any animators, designers, and compositors. If you want to create motion graphics and visual effects for film, TV, video, and the web then use Adobe after effects .Since it's so widely used, tutorials are readily available, so you can create anything you need. Troubleshooting is also easy because of the large community of Adobe after effects. I have used After effects for a variety of digital work. I have used it to create video mock-ups for social media, companies or other digital ads. I have used it to create cinematic movie titles, intros and transitions. I have Animated many logos or characters as a part of video mock-ups for many businesses. "One of my core tools for motion graphics and compositing." I've been using After Effects since I began animation so familiarity, intuitive UI and customisation via plugins. I generally will use After Effects in conjunction with Photoshop, Illustrator and sometimes Premiere as A) They all work well together and B) each of these tools is part of Adobe's Creative Cloud which is a monthly or yearly subscription. If you create 1 video for a client a year - it practically pays for itself. RAM preview is great to have and although there's tricks you can do and settings you can change to ensure speed and quality previews - it still takes time to RAM preview some projects. I know this is down to RAM on your machine but in an ideal world it would preview quicker. Used for VFX, animation and motion graphics - this is the go to tool you need. Highly recommend After Effects in any production environment. You can purchase a license subscription of Adobe Creative Cloud which includes many other great software packages such as Photoshop, Illustrator, Flash (Animate) and Premiere as well as After Effects. It's only getting better with every release. I can create videos for all sorts of clients and not just standard HD or 4K. Using inexpensive plugins you can create 360 videos too. I would highly recommend plugin websites to see the extended use of After Effects including creating templates that auto update, as well as the standard tools for character rigging and batch rendering. "After Effects — The Land of Unlimited Possibility"
After Effects continues to surprise and impress me with each new update. My favorite elements of the program are the masks and the user interface. After Effects has incredibly intuitive and easy to use masking. For anyone who has tried to mask anything in Premiere, you're doing it wrong. Beyond that, as a user of most of the Adobe Suite for over a decade, I've always found After Effects to support the most intuitive UI for photo editing, video editing or animation. It's incredibly easy and quick to organize projects, and the timeline is simple to navigate. The use of layers, and keyboard expandable controls for any keyframe item, is essential to using the program. And then there's expressions. Whoah. It's a bit intimidating to start, but once you learn the software and a get the hang of it, the possibilities are unlimited. Being able to quickly apply composite, design titles, design animated elements or design and animate entire animations within one program is wonderful. I'm not a fan of the sheep error sound. If you know it, you know it. And the built-in color correction tools are really disappointing. There are third party options to add waveforms and setup a similar capability to a true color program, but this has always been the one area of visual post where After Effects has been most frustrating. This is a software with so much power, and so much potential, with the ability to apply 3D camera tracking and adjust masks based on tracked items, yet the color wheels are akin to FCP 7's three-way-color corrector. Every year I hope Adobe will come out with an update offering a full fledged color suite within After Effects, yet every year we continue to roundtrip items from After Effects to DaVinci for color. If we could do it all in After Effects it would allow for more seamless and more efficient compositing. There's nothing quite like it. Give it a whirl. There are plenty of great tutorials to learn how to use the program. Use them. After Effects is best learned through experience. After Effects is essential for my business. I use it on every edit. After Effects allows me to quickly apply titles and to composite elements on live actions. We also use After Effects to create 2D animations, or to adjust and finesse the look of 3D animations. We edit in Premiere, though After Effects is really the center of the modern post-production workflow, and it allows you to put almost anything you could imagine on screen. the adobe after effects in one of the most popular VFX and animation software available in the market. there are many high-end tools available in the software to make the most out of the artist within you after effects is available for Mac and Windows operating system even thou i only used it on windows. there is a free trial from Adobe available for after effects that allows you to use the software for a whole month. its very easy to work with different files on the software, you can easily work between Photoshop PSD files and Illustrator file and create awesome compositions, the limits don't exist here. one of the major advantage i found in after effects which other animation softwares lack is the ability to edit the workspace to your liking and it saves a lot of time. the learning curve for the software is too steep, it took me several courses and thousands of youtube videos before getting familiar with the software. this software is literally eating ram, the compositions are played by sending them to memory known as ram preview, which needs a whole lot of ram. my system got 32 Gb of ram which wasn't enough to run the software smoothly. the software is really costly and normal designers and the low end companies wont be able to take advantage of this awesome software. if you're into animation you should have heard of this software. this is one of the best out there. i recommend you to try the software first with the free trial and if you can afford it, buy it. Adobe after effects is a software used mainly for VFX and animation composition. "Makes video animation look easy!" With the tools and timeline similar to Premier and other Adobe products, it make learning AE's tools fairly intuitive. And Adobe provides a TON of online training resources to learn the ins and outs - not to mention the thousands of video tutorials on YouTube. As a trained print-designer, I had no issues learning and using After Effects when my new position also involved doing video editing and production. TONS of built-in tools and effects, and a HUGE user and support community with lots more to offer. Integration with the other Adobe products (Photoshop, Premier, Audition, etc.) just makes it that much better! There's a little bit of a learning curve, but not bad. In general, I dislike Adobe's subscription model for their products. If you are already familiar with Adobe's family of Creative Cloud/Suite products, the learning curve is fairly simple. As a trained print designer, I would recommend After Effects as a great tool for developing video animations and effects. We develop training and always are needing custom animations for demonstrations or for intros/outros to our training videos. AE fills the bill nicely. "Flexibility, Robustness, and Constantly Improvements Make After Effects Top Choice for Motion GFX"
The flexibility offered by After Effects, especially when matched up with high-powered plugins like those offered by Video Copilot and Red Giant. It's also fantastic when used in conjunction with Cinema 4D, since a direct-link workflow is a part of the software build. Would prefer that Expressions was a little more accessible and user-friendly. If you're looking for a robust, flexible and constantly-evolving motion graphics software package, After Effects is easily your go-to choice. With annual upgrades, After Effects is continually introducing improvements to the platform that keep the software valuable, freesh and up to date. After Effects allows me to create high-end motion graphics for nearly any video project. It has been invaluable in both the creation of video opens, logos, and animated graphics as well as Hollywood-level special effects for various videos. "Integrates with vector editors like Adobe Illustrator and makes a direct link"
What I find most helpful about Adobe After Effects is that it integrates directly with Adobe Illustrator, so I can import these graphics that I have created and still maintain perfect quality. I dislike how slow Adobe After Effects can be, and how preview graphics generally have to be at a lower quality to maintain a usable editing speed. Adobe After Effects has benefited me when creating motion video graphics by integrating with Adobe Illustrator. I can import vector graphics, and maintain perfect quality, and I can also update the original file and it is automatically updated in Adobe After Effects. This has been of great benefit to me as it saves lots of time and I only have to have graphics in one location. "After Effects represents the video Photoshop"
After Effects is a fantastic software that allows you to create video compositing and motion graphics with an efficiency and professionalism that no other software can do. Not very simple or immediate to use, it still requires skills in video editing and, better still, also in Photoshop. In any case, it works great with software such as Premiere Pro, Audition, Cinema 4D, considering that projects can also include the use of three-dimensional graphics. It is not very immediate in use but, since it is a highly professional software, it is also right that it is so. I thought that you could maximize compatibility with Photoshop when using the timeline panel from the latter, in any case After Effects is a software that never ceases to amaze. It is certainly a very specific software, especially suitable for expert motion designers or who want to experiment creating video clips with very special effects and not feasible with other software. The basic functions are not difficult to learn, then obviously you must already be able to use elements such as 3D, perspective or vector graphics to increase its potential and exploit it fully. I used After Effect mainly to create motion graphics for my clients, to be exploited in the sponsored ads of Facebook or Twitter, with results that I can not get using Photoshop or Premiere. I mainly create videos with animated lettering that can capture the user's attention, thanks to the presets present in the software. Can literally animate anything. Though Adobe Ch (Character Animator) is meant for custom cartoon animation you can also rig cartoons into After Effects as well. There are tons of tutorials out there to teach yourself though I recommend going to a certified program for basic training. However since there are many templates out there you can create many designs with ease compared to older versions of after effects. You would be surprised to see all of the graphic elements that you find in TV shows or movies that you can create in After Effects. There are a few ways to achieve the same animation. Wish it came with more templates. Go through training and spend time on YouTube finding tutorials. I recommend going Lynda.com for more tutorials also rocketstock.com has great templates for adobe after effects. Also, depending on your use for the program, understand design elements and typography could help as well. For our clients animation needs. Along with graphics to put into our videos. It gives it a more professional touch compare to our competitors. this is one of the popular application when comes to motion graphics and visual effects. there are tons of features for everything you can think of. the program works seamlessly and integrates well with cinema 4d, Maya and other creative cloud products. its supported by mac as well as pc, so there is no question about it. the software is popular so you can easily share projects. there are also tons of add-ons available in the web to make your job easier. the support from the adobe is also great. the after effects is really hard to learn unless you got experience in previous versions, the number of tools and options can be intimidating. i found the learning curve too steep for a new user who wants to get into VFX and animations through after effects. the pricing isn't cheap and it's a subscription-only model,a normal user or someone who just gets into the industry won't be able to afford such a software. the program is heavy on the system, I had an 8 GB memory system with Intel i7 7700HQ, still got system frozen when working with 3D projects and it's really frustrating. when it comes to video editing the software is next to nothing without premiere pro alongside. the inbuild rendering options are terrible and media encored is a necessity when it comes to rendering projects. the program isn't cheap and needs a heavy system to perform well. if that's not a problem go for it, you wont regret it. creating animations as well as tracking pixels in projects. 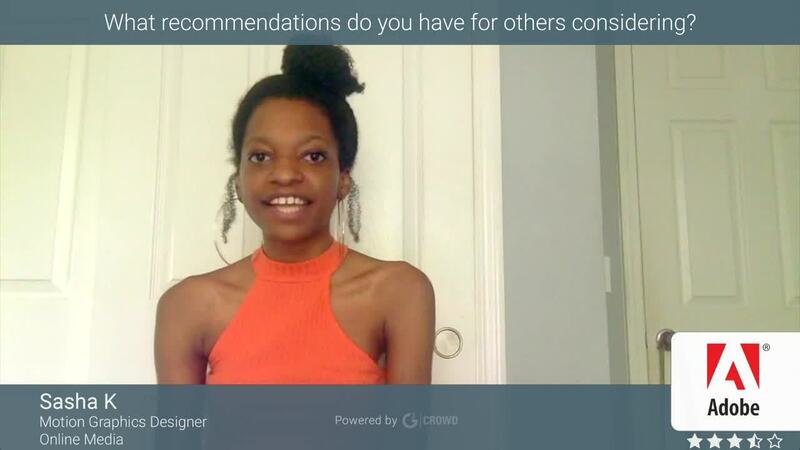 "Intermediate After Effects user review"
My background is in graphic design and illustration, so I really love all the possibilities for creativity that After Effects offers!! I can put my designs into motion in so many ways, plus add sound into the mix. I was intimidated by the program at first, but after learning how to use it better, I've found it to be really meditative and fulfilling. I feel like some items are hidden or cumbersome to get to. For example, changing the background color in a layer is so much quicker in Photoshop. I also occasionally forget the shortcuts for keyframe options (for example I'll hit "O" for opacity but the shortcut is actually T). It is also not ideal that unless you hit "U" on the keyboard, After Effects limits the animation effects you have applied in the timeline. Explore tutorials online to help learn new tricks and techniques! Watching tutorial videos online has been very helpful to me. I've been able to create captivating animated content for my clients' social media channels, as well as animated promo videos, DVD menus, and video backdrops for live music events!